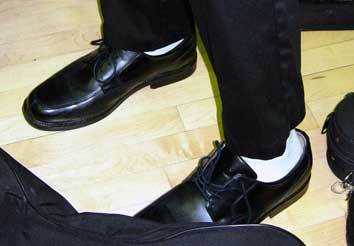 NO white socks! Black socks a must! Boys will wear a solid white long-sleeve men’s dress shirt (no tux shirt), solid black dress pants (no denim or no courduroy), solid long black socks (no bare ankles please), & solid black dress shoes (no tennis or no gym shoes). A solid black belt or solid white under shirt may be added if needed. A red long tie will be issued at the concerts. Ladies will wear a solid black tank mid-length dress, solid black dressy flats (no Toms, no tennis shoes or no heals) & solid black or skin-tone no-show socks. This gives each ensemble a professional look on stage while also giving flexibility and multiple options for students’ individual needs, using formal clothing that can work for other occasions and functions. All students will be provided with attire based on availability. This concert attire must be returned at the end of the year in the same condition as received. Students who fail to return the attire or who return attire that is damaged beyond ordinary wear and tear will be required to reimburse the school for the full replacement cost. We understand that some students may want to purchase their own concert attire. Due to the uniformity of the women’s dresses, we are providing an opportunity for students to purchase dresses through the school if desired. 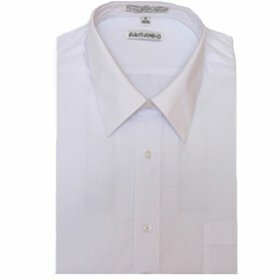 Men’s dress shirts may also be purchased through the school or any vendor of your choosing. Due to the complexity of the exact measurements for the dress and shirts, adults who know how to measure will measure the students at school on Friday, Sept. 14th. Students will receive their shirts & dresses in time for their choir pictures and concerts. Do you have questions about concert dress? Please contact us as soon as possible. Students or parents must notify the teacher/director as soon as possible (and in all instances at least 7 days in advance of a performance or other activity where concert attire is needed) regarding any issues, questions, or problems with concert attire. Students who fail to notify the teacher and are then not appropriately dressed for the performance will not be allowed to perform. 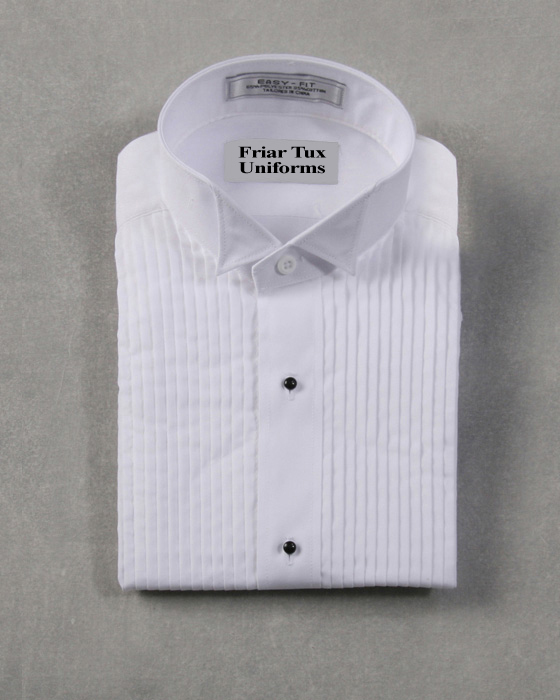 In general, this typically consists of a white long-sleeve 1/4" pleat tux shirt with 4 black studs, solid black dress pants (no denim or no courduroy), solid long black socks (no bare ankles please), & solid black dress shoes (no tennis or no gym shoes). A solid black belt or solid white under shirt may be added if needed. Ladies have a second option and are asked to wear a solid black, short or long sleeve, full-length dress with solid black tights. A bow tie will be school owned and issued at every concert. This gives each ensemble a professional look on stage while also giving flexibility and multiple options for students’ individual needs, using formal clothing that can work for other occasions and functions. All students will be provided with attire based on availability. This concert attire must be returned at the end of the year in the same condition as received. Students who fail to return the attire or who return attire that is damaged beyond ordinary wear and tear will be required to reimburse the school for the full replacement cost. We understand that some students may choose to purchase their own concert attire. We are providing an opportunity for students to purchase concert attire through the school if desired. Due to the complexity of the exact measurements for a tuxedo shirt, adults who know how to measure will measure the students at school shortly after the start of the year. Students will receive their shirts in time for their band/orchestra pictures and concerts. Questions about Concert Dress? Students must notify the teacher/director as soon as possible (and in all instances at least 7 days in advance of a performance or other activity where concert dress is needed) regarding any issues, questions, or problems with concert attire. Students who fail to notify the teacher and are then not appropriately dressed for the performance will not be allowed to perform. For those of you who did not purchase your concert attire through the school, but still want to purchase the exact same items. Please go to Friar Tux for the tux shirts (ask for the school discount) or www.tuxedowholesalers.com for the "Dakota" style dress. You will be able to purchase any of these items through the school only during the first weeks of school. You are always welcome to purchase like items on your own at any vendor, borrow a shirt from the school, and the same outfits are used every year. It's a "Wash & Wear" dress and basically does not wrinkle. It will need to be shortened. Please note that the Constitution of the State of California requires that we provide a public education to you free of charge. Your right to a free education is for all school/educational activities, whether curricular or extracurricular, and whether you get a grade for the activity or class. Subject to certain exceptions, your right to a free public education means that we cannot require you or your family to purchase materials, supplies, equipment or uniforms for any school activity, nor can we require you or your family to pay security deposits for access, participation, materials, or equipment.